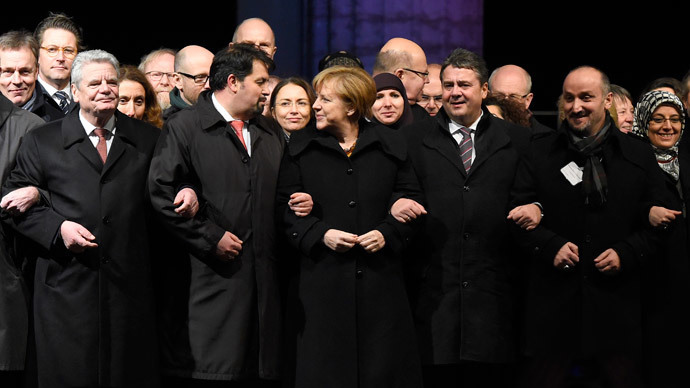 German leaders joined the Muslim community for a rally in Berlin to commemorate the victims of the Paris attacks and to promote “religious tolerance” amid ongoing mass rallies against immigration policies and the growing “Islamization” of the West. Chancellor Angela Merkel and President Joachim Gauck joined the rally, which promoted tolerance and religious freedom. The event, which was organized by the country's Muslim community and Turkish groups, took place near Berlin's Brandenburg Gate on Tuesday evening. Imams recited Koranic verses, while Christian, Jewish, and Muslim religious leaders read speeches commemorating the victims of the Paris terror attacks. This was followed by a minute of silence. "Our answer to the fundamentalism of the Islamist perpetrators of violence is democracy, respect for the law, respect for each other, respect for human dignity,” said Gauck. The ‘unity and tolerance’ rally came just one day after Patriotic Europeans Against the Islamization of the West (PEGIDA) gathered 25,000 demonstrators during a rally in Dresden on Monday. The rally was the 12th in a series of weekly protests that seek to “protect” European culture and Christian values against growing Islamization. Members of the rally also commemorated the victims of Paris attacks. The rallies come as tensions continue to mount over the role of Islam in Germany. A survey carried out in November and commissioned by the Bertelsman Foundation think-tank said that 57 percent of non-Muslims surveyed thought that Islam threatened German society. In addition, 61 percent of respondents said that Islam did not fit into Western society. According to census data from previous years, Islam is the second largest religion in Germany after Christianity.